There has been much hullabaloo about Harper bring back the old chestnut of abortion – the reporting on this issue reflects the general opinion about Harper from many commentators (for example Rex Murphy, Don Martin) which seems to be that this issue only plays to the Conservative base, demonstrates Harper is an ideologue, and won’t allow him to gain a majority. I believe it is much more Machiavellian than that. Except by complete implosion of one of the 4 main parties, there will be a minority government, and Harper knows it. Of course he will never say this – keep the dream alive! – but he is too canny a player not to realize it. So, if we put his actions on abortion and other policy pronouncements such as climate change within this context, what he is doing makes sense. He is energizing his base through wedge issues, just as one Karl Rove was so good at with George W. in the states. Activate the base, demoralize the others. 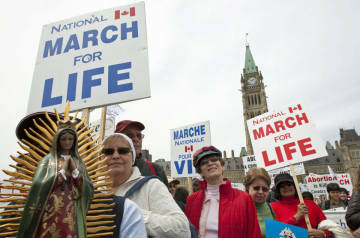 So the 10,000 people on parliament hill rallying against abortion with 18 Conservative MPs in tow? All dyed-in-the-wool-never-to-vote-for-anyone-but-Stephen supporters.Those 10,000 people are the vanguard, and they will assure Harper his minority and slim chance majority (watch for a Conservative/Bloc alliance in the next election). The Armageddon Factor is a good read on the religious right and Conservative politics in Canada, or read some quotes from evangelical youth leader and Conservative darling, Faytene Kryskow. She believes her Christian fan club should emulate the Hitler Youth, who she admires for mobilizing people to their cause, and ponders how much more who group could accomplish with the power of God behind them. To understand her impact, Check out her group MY CANADA and her blog, which outlines her political work like the recent face to face meetings with 30 MPs and the reception she hosted that had in attendance 70 conservative MPs. Harper has made the calculation that it will be a minority government – and has duped the media and the general public into believing that a coalition against him would be the coup d’etat by the social hordes. The other parties? Still trying for a majority seemingly. Until such time as the NDP – who have never been in government – and the Liberals – who believe they have never been out of government – get together and strategize it will be Harper all the way.